Protein folding is difficult to simulate with classical molecular dynamics. 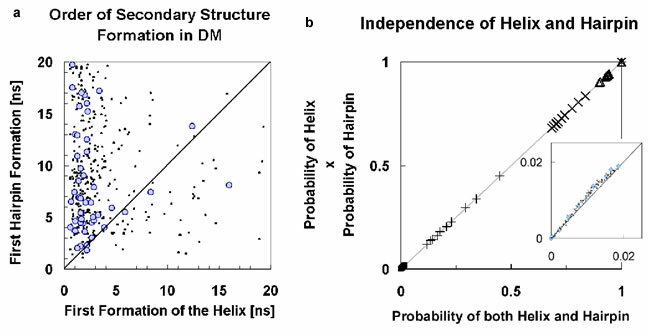 Secondary structure motifs such as α-helices and β-hairpins can form in 0.1–10 µs (ref. 1), whereas small proteins have been shown to fold completely in tens of microseconds2. The longest folding simulation to date is a single 1-µs simulation of the villin headpiece3; however, such single runs may miss many features of the folding process as it is a heterogeneous reaction involving an ensemble of transition states4,5. 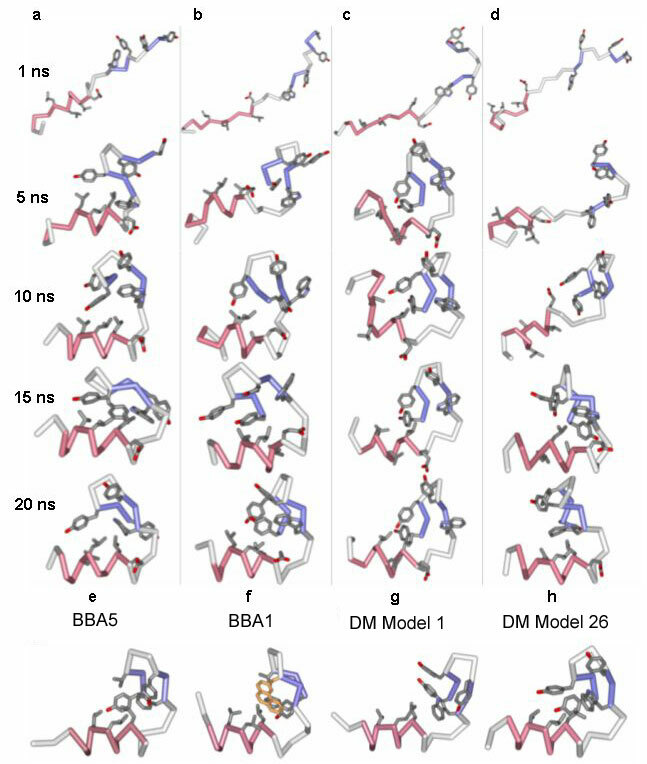 Here, we have used a distributed computing implementation to produce tens of thousands of 5–20-ns trajectories (700 µs) to simulate mutants of the designed mini-protein BBA5. The fast relaxation dynamics these predict were compared with the results of laser temperature-jump experiments. Our computational predictions are in excellent agreement with the experimentally determined mean folding times and equilibrium constants. The rapid folding of BBA5 is due to the swift formation of secondary structure. 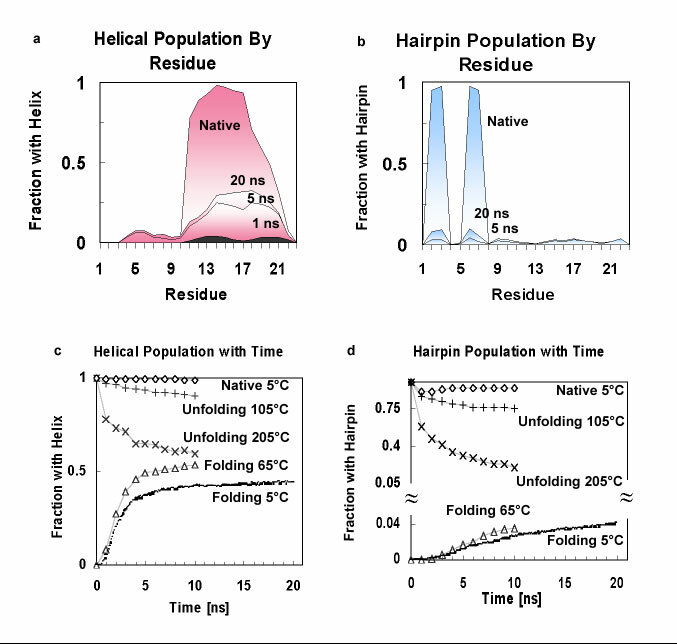 The convergence of experimentally and computationally accessible timescales will allow the comparison of absolute quantities characterizing in vitro and in silico (computed) protein folding6. We thank the Folding@Home volunteers whose processor power made this work possible; the members of the Pande, Levitt and Gruebele laboratories for discussion; J. Ottesen for the BBA5 coordinates; B. Imperiali for NMR data; the UIUC Laboratory for Fluorescence Dynamics; and the Suslick group for equipment use. C.S. was supported by a pre-doctoral Howard Hughes Medical Institute fellowship. V.P. and the Folding@Home project were supported by the National Institutes of Health (NIH), American Chemical Society-Petroleum Research Fund, National Science Foundation Materials Research Science & Engineering Centers, Center on Polymer Interfaces and Macromolecular Assemblies seed funds, and a gift from Intel. H.N. was supported by an NIH biophysics training grant. H.N. and M.G. were also funded by the NIH. Correspondence to Vijay S. Pande or Martin Gruebele.